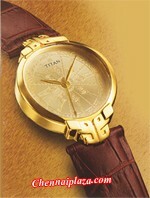 Watches & Timepieces > Titan Watches > Heritage collection. Item Description The biggest and the fiercest battle in Indian mythology was fought for dharma and this epic is now captured over again in this timepiece. 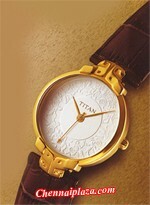 Item Description The imposing chariot wheel on this watch belongs to the majestic sun god himself. Reminiscent of the stone architecture era, the elephant carvings and golden crown etched at the sides are inspired from the temple dome. 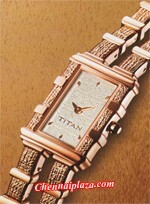 You will adore this finest masterpiece anytime you wear it. Item Description Inspired from the indispensable part of Hindu Temple architecture, this intricately etched golden column is bestowed with cosmic powers. Taken right out of the Atharva veda, the stambha supports the cosmos and material creations. 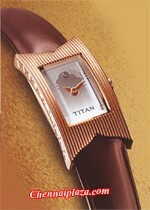 Masterpiece created to keep you strong and tall like the character of the Stambha. Item Description The lovely Mughal women's window to the world was a Jharokha. These jharokhas, etched on the dial and on the sides of this timepiece, hum a million romantic tales of the havelis, the crystal on its dial whispers tales of its past regalia.